BetinAsia - review by Blogabet. If you are a long-term punter, you surely know that you may have troubles opening accounts with some of the best Asian bookmakers on the market. One of the best ways to fight this is using the service of a betting broker. BetInAsia is one of the betting brokers on the market that can help you with those problems, but let's see in more details what they will offer you. BetInAsia offers bookmaker accounts with some of the biggest and most popular Asian bookmakers and betting exchanges. The bookies you can open accounts through BetInAsia are the following; Orbit, 9wickets and Turf7 exchanges, PS3838/Pinnacle, Singbet, BetISN, Matchbook, SBObet, IBCbet/MAXbet, 18bet, Babibet, Citibet. BetInAsia falls under the jurisdictions of Curacao and operates under the Curacao GA license. Another great feature that BetInAsia offers is Skype betting service. Skype betting is, at this point, a well-known and convenient service preferred by some players looking for larger stakes than the Asian bookies can offer. Through Skype and email you have access to betting events and live support from their team to help you in all your betting needs. Another advantage is that BetinAsia's Skype betting offers a "No void guarantee". Skype betting service is available from 9:00h till 23:00h CET. BetInAsia is also an agent for the Betfair whitelabel Orbit Exchange, which will allow you to maximize your profit by making exchange bets on various sports markets. With BetInAsia you will also get a commission as low as 3% on winning bets. BetInAsia recently also launched BetInAsia Black, which is a whitelable on Mollybet's multi-bookmaker platform. Black service is a multi-bookie betting platform which offers aggregated real-time odds and limits from a comprehensive list of difficult to reach Asian bookies. A single BetInAsia Black account will give you the best odds and the highest limits in all major Asian bookmakers, i.e. Pinnacle Sports, SBObet, IBCbet, Singbet, BetISN together with the major exchanges. It is very advanced sports trading platform built for the needs of professional sports bettors. A BetInAsia Black account will offer you odds from different bookies for the following sports: Football (including Half Time and Corner bets), Tennis, Basketball, American Football, Baseball and Ice Hockey. The minimum bet amount in BetInAsia Black is as low as 10 EUR, meaning it can be suitable even for recreational players. The interface of Black platform is clear and easy to use. On the right you will see your credit, balance and open bets. You can select your sport from the drop-down menu. After that find your event, select the amount you want to place as well as the odds and you are all set with your bet. Another big plus is that all newly registered players to Black will get a 0.1% cashback on their bets. The cashback can get even bigger for VIP and eligible players. See the full Terms and conditions for this promotion. If you are a professional punter, arber or just looking for the best tools to beat the market, you definitely need to give this a try. The VIP service is tailored more to professional bettors, who bet with higher amounts. You will receive VIP service from a dedicated support team, who is ready to help you with all your matters and provide you great customer service. You will be enjoying safe and faster payments. In order to become a VIP member, you need to contact BetInAsia at support@betinasia.com. BetInAsia offers secure payment methods for depositing and withdrawing. 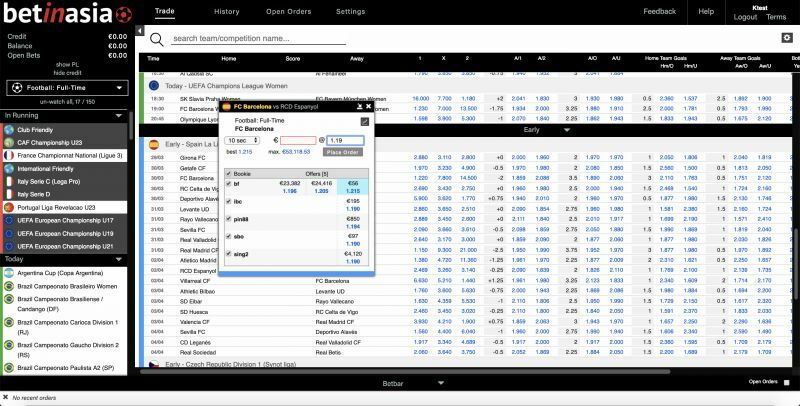 You can also easily split money between your betting account with BetInAsia, which is quite convenient for players with multiple accounts. BetInAsia offers the most popular and common methods of payment for such a service, i.e. Skrill, Neteller, EcoPayz, Visa/Mastercard, American express, Bank transfer and bitcoins. The currencies that are offered are EUR, GBP and USD. However, with Neteller and EcoPayz you can solely deposit in EUR. Depositing with each payment method is free of charge except Visa/Master Card and Amex where BetInAsia charge a 5% transaction fee.. The minimum deposit is 100 EUR or the equivalent in other currencies. The minimum withdraw is 100 EUR as well. For all payment methods, except bitcoin, you can make one free of charge withdrawal every 30 days. All other withdrawals within the 30-days period will cost you 2% of the withdrawn amount. The 2% fee applies to all withdrawals with bitcoins. You can contact a representative of BetInAsia via email at support@betinasia.com or Skype, Username: BetinAsiaSkype. A drawback is that no live-chat or phone service are available. No reviews yet. Be the first to rate betinasia!